Despite being a feat of engineering and research, the International Space Station's days are numbered, with some estimates aiming between 2014 to 2020 for its end of operations. 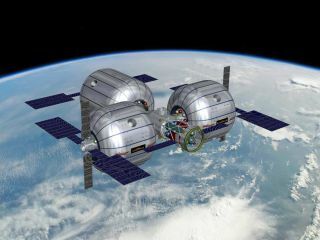 But Bigelow Aerospace of Las Vegas, Nev., hopes to build new inflatable space stations like that shown above for commercial uses ranging from tourism to research and other fields. Space may be TV's final frontier, but it's only the beginning for many pioneers and entrepreneurs hoping to expand humanity's reach beyond planet Earth. Choose your favorite space innovator from this group of the top 21st century space pioneers. Elon Musk is a tech and business polymath. He co-founded PayPal and the electric-car firm Tesla Motors, and in 2002 he founded the private spaceflight company Space Exploration Technologies (SpaceX for short). SpaceX aims to cut the cost of spaceflight and increase its reliability by a factor of 10, thereby spurring a revolution in space exploration and development. The company is well on its way — it has scored a $1.6 billion NASA contract to ferry cargo to the International Space Station using its Dragon spacecraft and Falcon 9 rocket. With December's successful test flight of Dragon and the Falcon 9, SpaceX became the first private company ever to re-enter a spacecraft from Earth orbit. And transporting astronauts may be just around the corner; SpaceX recently submitted a proposal to NASA to upgrade Dragon to a crew-carrying craft. Musk is not just a figurehead at SpaceX. He's the company's CEO and chief technology officer, and he's lead engineer for Dragon, Falcon 9 and SpaceX's Falcon 1 rocket. Wherever SpaceX goes, Musk will be in the driver's seat. Entrepreneur Robert Bigelow owns the Budget Suites of America hotel chain, but he's not content just renting out rooms here on Earth — he heads a company that's leasing out space on inflatable habitats in orbit. Las Vegas-based Bigelow Aerospace builds space modules that pack down small for launch but expand greatly in orbit, providing much more room for less cost than typical, hard-walled habitats. Bigelow launched test modules in 2006 and 2007, and the company is now ramping up production and catching customers' eyes. In 2010, Bigelow inked deals with six different clients, ranging from space agencies to government departments to research groups. The firm is also apparently in discussions with NASA about attaching a Bigelow habitat to the International Space Station. Bigelow's inflatable habitats could also be set up on celestial bodies such as the moon, according to the company. Bigelow has voiced ambitions to set up a lunar base, which would be assembled in orbit and lowered down to the surface. If people are going to explore and develop space, they'll need places to stay, and Bigelow aims to provide them. British entrepreneur Richard Branson started up Virgin Records in the 1970s, then expanded the Virgin brand into many different realms, including telecommunications, commercial aviation — and now space tourism. Branson heads Virgin Galactic, which plans to take paying customers on suborbital joyrides that will give them a few minutes of weightlessness and a great view of Earth below. The company's spaceliner — built by aerospace firm Scaled Composites, and known as SpaceShipTwo — is carried up to 50,000 feet by a mothership, at which point it fires its rocket engines and blasts into suborbital space. SpaceShipTwo has made several successful glide flights already, and Branson has said Virgin Galactic could be carrying tourists by the end of 2011. So far, about 400 people have put deposits down for a seat. But that's not all. The company also has ambitions to make orbital tourist flights, to carry astronauts to and from the International Space Station and to start up intercontinental flights, which could ferry passengers around the world much faster than the old supersonic Concorde jet. With Branson's record of success, it's wise not to count him out. John Carmack's roots are in computer programming. He made a fortune after co-founding id Software, the company behind the popular Doom and Quake video games. Then he turned his some of his attentions to private spaceflight, forming Armadillo Aerospace in 2000. Armadillo is developing a modular rocket system, with the goal of taking civilians first to suborbital space, and eventually to orbit. The company has had a great deal of success thus far. In 2008, it took home $350,000 for winning Level 1 of the NASA-sponsored Northrop Grumman Lunar Lander Challenge, which required spacecraft to complete a variety of tasks. The next year, Armadillo snagged the $500,000 second-place purse in Level 2 of the competition. And Armadillo has signed a deal to provide craft for space-tourism firm Space Adventure's suborbital flights, which will charge about $102,000 per seat. Armadillo officials have said that the company approaches rocket design much like software design: Build many subtly different variants, and test them frequently. Maybe this method will result in spacecraft as successful, in their own way, as Doom or Quake. Peter Diamandis is a private-spaceflight pioneer, having worked for years to increase and improve access to space. In the 1990s, Diamandis co-founded the Zero G Corporation, a company that takes passengers up in a modified Boeing 727 that flies in parabolic arcs, creating an approximation of weightlessness. He also started the X Prize Foundation, which seeks to spur great advances for humanity via large cash rewards. The Foundation's Ansari X Prize offered $10 million to the first privately funded team to put a manned vehicle in space twice in the span of two weeks. In 2004, a team led by Microsoft co-founder Paul Allen and aerospace engineer Burt Rutan won the prize with its SpaceShipOne. The X Prize Foundation has now raised its sights, and raised the stakes. Its Google Lunar X Prize is staging a privately funded race to the moon, offering $20 million to the first team to land a robot on the lunar surface, have it travel at least 1,650 feet (500 meters) and send data and images back to Earth. More than 20 teams have thrown their hats in the ring. Steve Squyres, an astronomy professor at Cornell University, has worked on many NASA planetary exploration missions over the years, beginning with the Voyager spacecraft's journey to Jupiter and Saturn. But he is probably best known as science lead for the incredibly successful Mars Exploration Rover project, which dropped the twin rovers Spirit and Opportunity onto the Red Planet's surface in January 2004. The golf-cart-size rovers were originally supposed to tool around Mars for a mere 90 days, but both far outlasted their warranties. Spirit stopped communicating with Earth just last year, and Opportunity is still going strong. The two rovers have fundamentally changed scientists' understanding of Mars, finding lots of evidence that the Red Planet was once a much wetter, warmer place. Spirit and Opportunity have also paved the way for future rover missions by testing out a variety of technologies. And, on a more abstract level, the rovers have brought Mars closer than ever before, making another world accessible to scientists and laypeople alike. Spirit and Opportunity have raised the Mars exploration bar high, and Squyres led the way. Burt Rutan, founder and chief technology officer of the California aerospace firm Scaled Composites, is perhaps the most innovative and accomplished aerospace engineer of his generation. He designed the Voyager plane, which in 1986 became the first craft to circle the globe without stopping or refueling. Rutan also developed the Virgin Atlantic GlobalFlyer, which broke Voyager's circumglobal speed record two decades later and enabled the first nonstop, solo flight around the world. Another of Rutan's creations, SpaceShipOne, is billed as the world's first privately built, piloted craft to make it to space. SpaceShipOne made headlines around the world in 2004 when it reached space twice in a span of two weeks, thereby winning the $10 million Ansari X Prize. Scaled Composites also designed and built Virgin Galactic's space-tourism vehicles — the SpaceShipTwo spaceliner and its mothership, WhiteKnightTwo, which carries it up to an altitude of 50,000 feet. SpaceShipTwo made its first solo glide flight this past October, and Virgin Galactic officials have said the craft could start carrying paying customers to suborbital space by late 2011 or early 2012. They'll all be riding on Rutan's vision. Alan Stern, a planetary scientist at the Southwest Research Institute and former NASA science chief, has been a key player in dozens of space missions and the new realm of suborbital research. But his biggest contributions may not be felt for a few more years. Stern is principal investigator of NASA's New Horizons mission, which is sending a probe streaking toward Pluto at about 36,000 mph (nearly 58,000 kph). He is also a strong advocate for suborbital science research and serves as an advisor for NASTAR, a company that offers training to researchers hoping to conduct experiments on commercial suborbtial spacecraft. New Horizons, the fastest spacecraft ever launched from Earth, sped from its home planet in 2006 and should reach Pluto by July 2015. While many missions have investigated Mars, Venus and other denizens of the inner solar system, New Horizons will be the first spacecraft to take a good, long look at Pluto and its three known moons, as well as other icy bodies in the frigid, faraway Kuiper Belt. New Horizons' observations should help astronomers better understand the outer solar system. And it should give them new insights into dwarf planets like Pluto, which far outnumber rocky worlds like Earth and gas giants like Jupiter in our cosmic neck of the woods. Greason, a former technical manager at Intel and Rotary Rocket Company, heads XCOR Aerospace, the private spaceflight firm he co-founded in 1999. In a little over a decade, XCOR has constructed 11 different rocket engines, and it has built and flown two manned, rocket-powered craft. Under Greason's direction, XCOR is also getting into the suborbital space-tourism business with the Lynx, a rocket-powered space plane. The Lynx seats only two people, but what it lacks in carrying capacity it will try to make up in flight frequency. The vehicle will be capable of taking to the skies multiple times per day, carrying passengers, scientists and payloads, according to XCOR officials. The first Lynx test flights could start taking place toward the end of 2011, Greason has said. Greason's expertise is recognized by those walking the halls of power. In 2009, he was one of 10 people picked for the Review of United States Human Space Flight Plans Committee — the so-called Augustine Commission, which reviewed the nation's human spaceflight plans and priorities. Bill Stone is president and CEO of Stone Aerospace, which develops tools and systems to aid in underwater and outer-space exploration. A few years ago, he started up another firm called Shackleton Energy, which could soon become one of the first companies to do business on the surface of the moon. The moon has huge stores of water ice in permanently shadowed craters at its poles. Shackleton wants to mine this ice and break it into its constituent hydrogen and oxygen — the chief components of rocket fuel. The company would then sell this propellant to spaceships from filling stations in low-Earth orbit, possibly spurring a huge wave of space exploration and travel. Getting this water from the moon should be far cheaper than launching it from Earth, since the moon's gravity is so much lower. Shackleton Energy has already received lots of interest from investors and is making steady progress, according to Stone. The company intends to send robotic scouting missions to both lunar poles within four years, with sales of propellant following shortly thereafter — possibly by the end of the decade.